At first glance, Craig Deppen Auge’s work can look chaotic, even frenzied in its making. 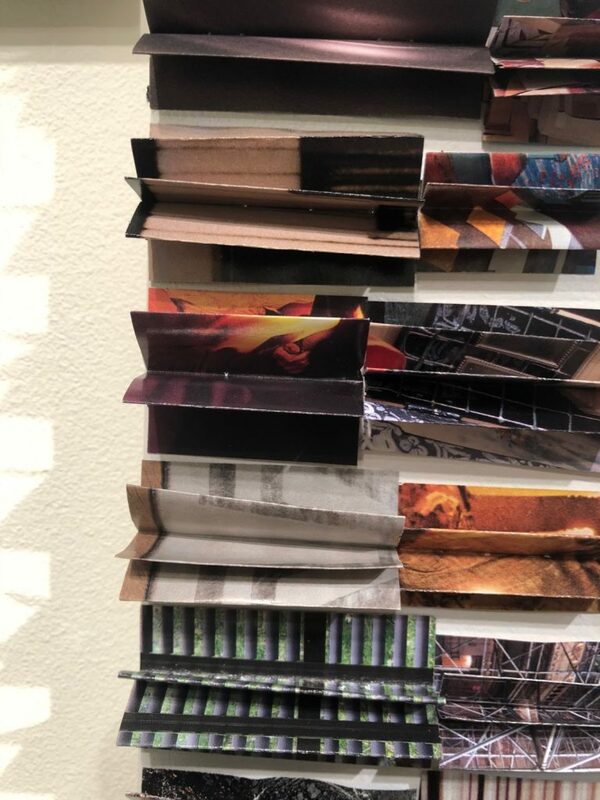 Folded paper is combined with collaged canvas on spray painted wood on metal rods, and on and on. He refers to this obsessive folding, collaging, and assemblage as ritualistic in nature. Auge grew up in the Appalachian region, where he was informed by a rich history of folk healing, witchcraft, and tradition that is nestled in the mountains. When examining the folds, with repeating shapes like triangles and circles, you get a sense that some kind of fevered spell was cast as he worked until the repetitive action had been exhausted completely. In considering this rhythm of movement between material, I found parallels between Auge’s process and music. I often think about art and music in the same headspace. While you can appreciate a particular composition for academic or conceptual reasons, sometimes you just like something because you’re attracted to the way it feels; you’re immediately pulled by the hook or material. This is the way I felt about Auge’s work. A shape, a color, a lyric, a moment about love lost floating into the ears of the heartbroken. The kind of violent joy a small child feels as they hold a puppy, all gritted teeth and glistening eyes. A visceral reaction. Often times the reason one is drawn to an object or song is deeper than initially thought, but the fact that its mere existence can magnetize you begs further exploration. Online this experience of being magnetized by images is becoming more and more universal. We scour websites and instagram accounts for those art pieces that have the form, color, light, that we know others might be drawn to and pass them around like kids trading lunch snacks. 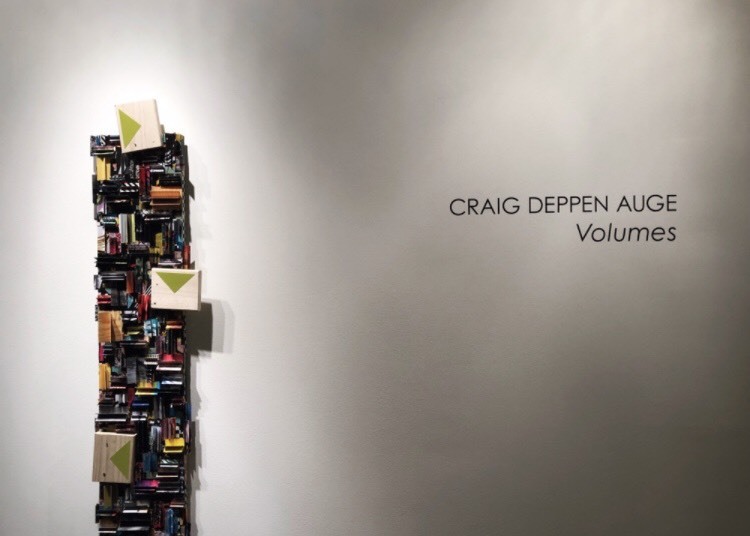 While Craig Auge’s work could absolutely be treated like one of these art snacks on small screen, you’d be missing out on deeper narrative if you didn’t personally delve further into the new works in this exhibition. 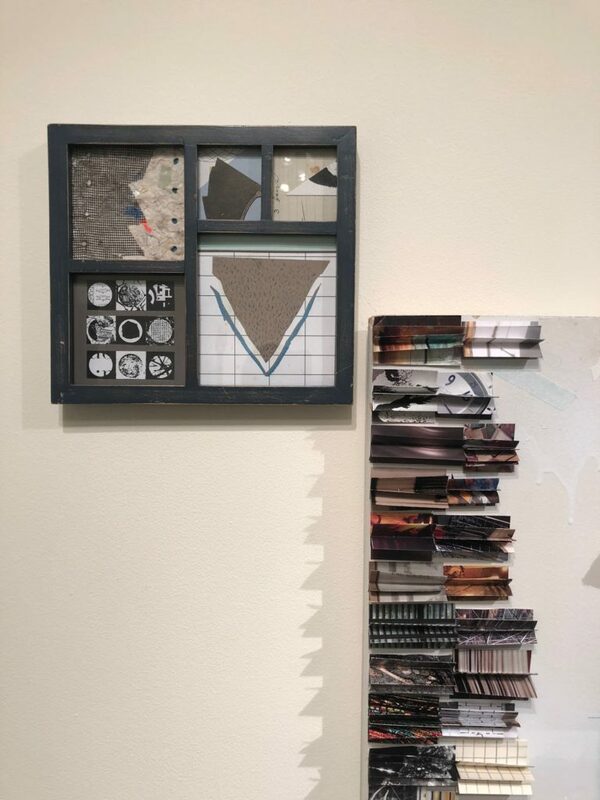 These works show pieces of the artist’s memory of home, both real and tangible, in one time period, now existing as broken down abstractions. This sense of place, longing, and belonging that these pieces can draw up are universally felt. In these works, you sense the deep nostalgia and memory of his childhood in West Virginia. Brightly colored ropes bring about memories of summer camp craft projects. Pieces of wooden architecture that look like they came from some reluctantly abandoned Victorian home, a pedestal made from a found coffee table leg, a small decorative embellishment from an ornate oak door, put together they create an abstract construction of a sacred space. In the piece Almanac III (Growth Chart, Album) you encounter a wooden panel with blue hatch marks on one side and successions of folded paper, what he calls “books” that read more like a textile, on the other side. Looking closely at these books, you discover small, infrequent human elements among the contrasting patterns – a hand, a clock face, the exterior of a home. The hatch marks are reminiscent of the lines a proud parent would scratch on a wall, tracking a child’s growth over the years. To the upper left corner of the wooden panel, you see a small blue frame that looks like a family photo frame. Each of these “family photos” are a collage, or piece of a collage, from a different time in his life. 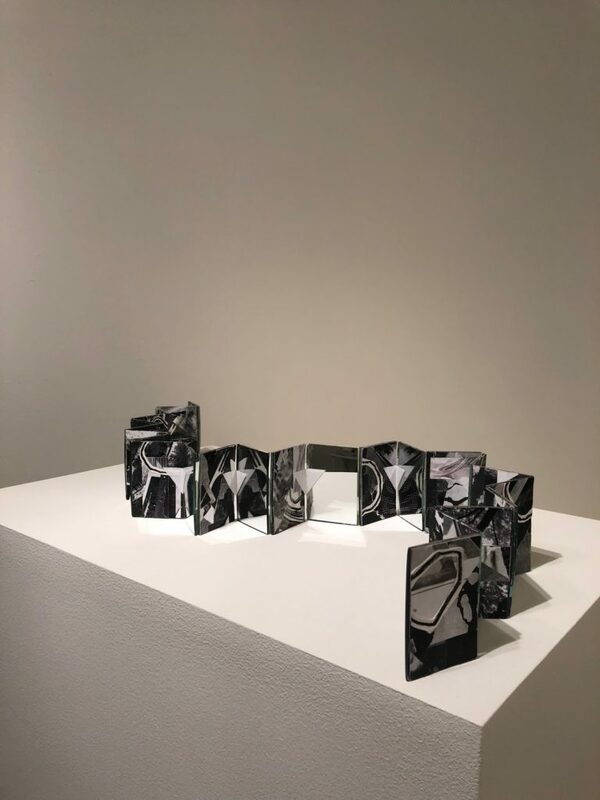 In the piece Stop and Go (Night Blindness) a folded accordion made of small collages are paired with mirrors of the same size. When you follow along the accordion, you find one continuous drawing made with wax pencil. 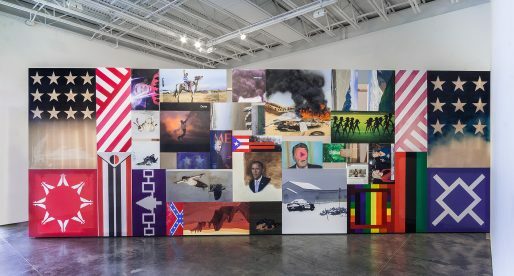 Looking at all of the pieces in this show, you find a sort of feedback loop – the existence of all of Auge’s “times” happening in one space and a quality of maximalism and minimalism working in tandem. 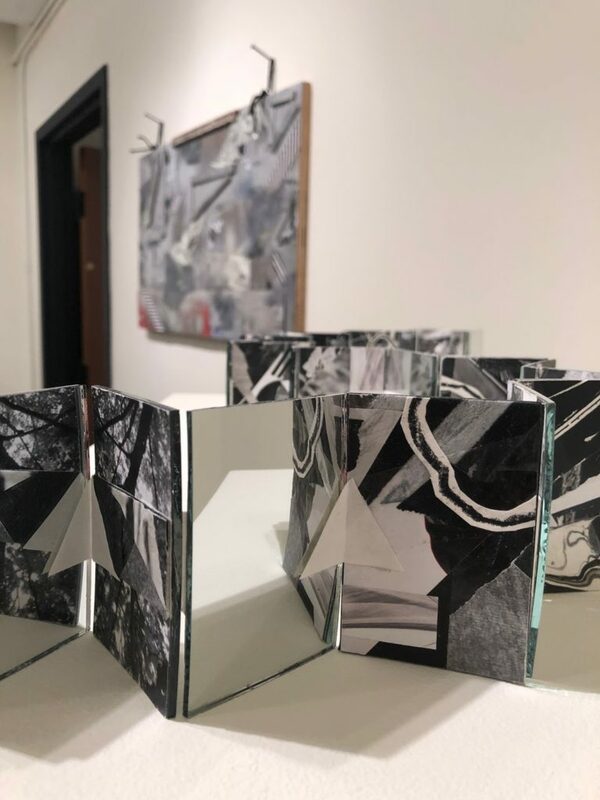 In this piece, you find the minimal, blank surface of the mirrors reflecting and confronting the maximal layers of unruly collage. The mirrors reflect your own time, threading it into a small, but complex through-line. 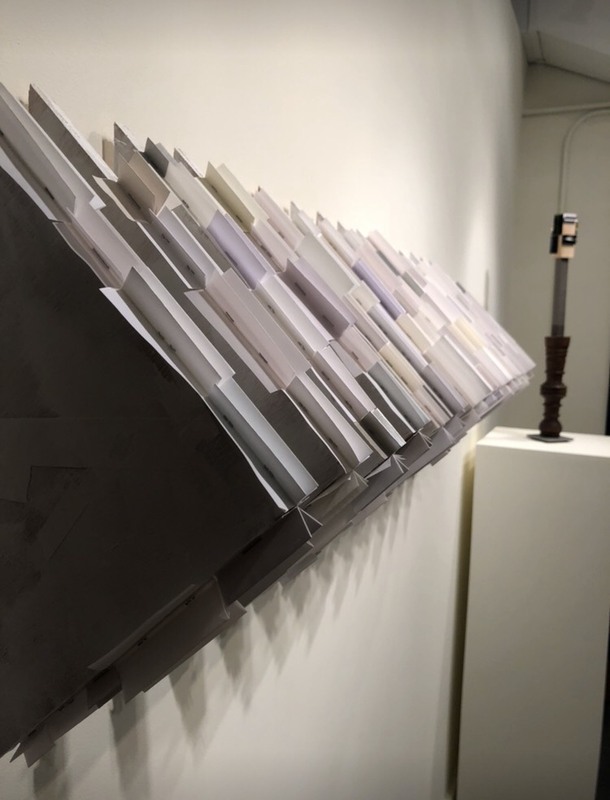 Reflective Chronicle (Muted) is series of canvas-covered wooden triangles, collaged with bits of paper, tape, paint, pencil, and other materials. 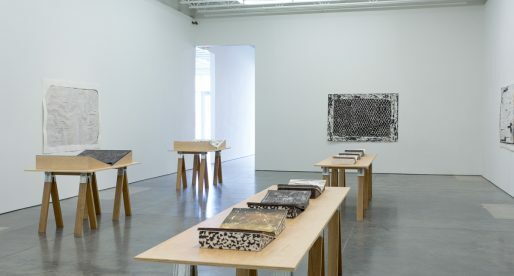 The material play and the elements of using what is readily available to the artist is somewhat childlike in nature, further reinforcing ideas about nostalgia and home. On the edges of each triangle are multiple pieces of folded paper. If you were to blur your eyes, this entire installation would look white – blank. But the subtle differences in shades and shadows create a story. The darkest of these shades – almost gray – come in the middle of the piece, and just like a book, they have a beginning, a middle, and an end. Because of the lack of color, Auge increases the interpretive potential of the works, allowing for the viewer to step into tiny divinatory worlds of tone. The pieces in this exhibition sprawl, unfold, lean, and play with the ductwork and lines of the walls above to create an entire composition that can be read from one end of the room to the other. There is a quality of traditional craft among the abstractions, with the repetition of triangular shapes, and the interchanging patterns, much like a patchwork quilt. A viewer could see some of these as unfinished, as though Auge set them up just before you walked in, or some magically conjured earthquake shook them into place. Either way you sense it is evidence that something has happened, and that you may not know what will happen next. What I enjoy most about the work in this exhibition, is that once I read through and metaphorically listened to all of the work, I felt a calm understanding. While the work may not always look like the result of a calm hand, the underlying feeling is one of welcoming. It felt like a reminder from Auge that we all yearn for a place or a time that is no longer, and we all wonder about who we were, and what we will become. There is an anxiety there that we experience, but that it is ok, because it is universal. The space that is created by his movements, and his installation choices, become a shared meditation. With these threads of time and place in Auge’s work comes an invitation to be present, a holy binding of future and past. “Volumes” presents itself with a view of both micro and macro, a composition both loud and soft – a playful story with a deliberate message.